I just finished watching “10th Annual International Sniper Competition” from LaRue Tactical. I had the disc for a while and with the blowing winter snow outside, I was looking for an inside shooting activity. Watching the DVD qualified. 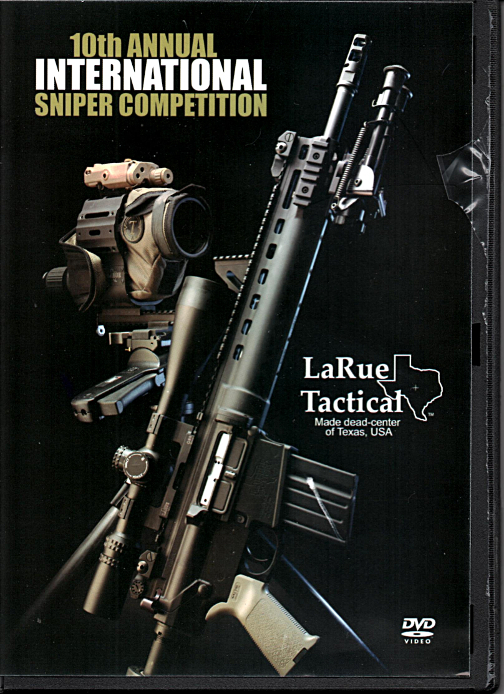 This competition was, according to the disc, the first time they opened competition up to police and LEO snipers. If you think you are a good long distance rifle shot, perhaps someone who is sniper good, watch the video. You may be surprised. I never thought I was sniper good. I can hit a 12 inch plate at 200 yards from the prone position, but that isn’t much of anything. This competition wouldn’t let me stand by the gate. The video had some interesting ideas. Both the sniper and scout often had the same rifle optics with the same reticle. This is taken a step farther and the spotting scope had the same reticle as the rifle optics. This is to facilitate communication between team members. Many stages had a provision that if you missed you had 10 seconds to correct and take a second shot. One of the better teams switched off roles as sniper and scout as needed. Perhaps one partner is better at calling wind at 700 yards than the other while the other was better at night shooting. They utilized individual strengths for the team. I recommend this approach from my own practical experience. Match each shooter’s skills to the task at hand. All the competitors zeroed at 100 yards and then confirmed it at 300 and 500 yards. At least one team took time to discuss PDAs and ballistic software to calculate ballistic coefficients from the data they obtained at different distances. The bullet drop calculation allowed them to dial in the correction for each stage. Most of the events were staged with a short time to shoot and an even shorter time to get back to the next shooting position. Clearly this wasn’t an event where everyone just took their time getting set up and making calculations. The video also had little commercials about sponsors’ products, chiefly LaRue, Leopold and Nite Hog. Still, there was information available about reticles, wind calculations, night vision and its screen resolution. All the winners were military. LEOs were outshot. Why? One shooter explained that you have to have a passion for distance shooting. You have to make the sacrifice and get out on the range and shoot non-standard distances under different weather conditions. You have to be willing to keep looking for the new next great thing, then evaluate and use or discard. I watched the military use thermal spotting scopes with IR lasers to indicate the target to the shooter with their night vision system. If you don’t have this gear, you can’t compete effectively against teams that do. And finally, at what distance do most police sniping activities take place? As one LEO sniper team told me last summer, “…if we have to shoot farther than 100 yards everyone is having a very bad day.” Reaching out to 500 and 700 yards is not normal activity for the police as compared to the military. Also competition at that level requires an all in approach and deep pockets. A LaRue gas gun with 0.7 to 0.5 minute groups currently runs over $2200. Let’s not even talk about the cost of precision ammunition. If you get a chance, watch the video or call up one on YouTube. I think you’ll enjoy seeing what’s possible with practice.